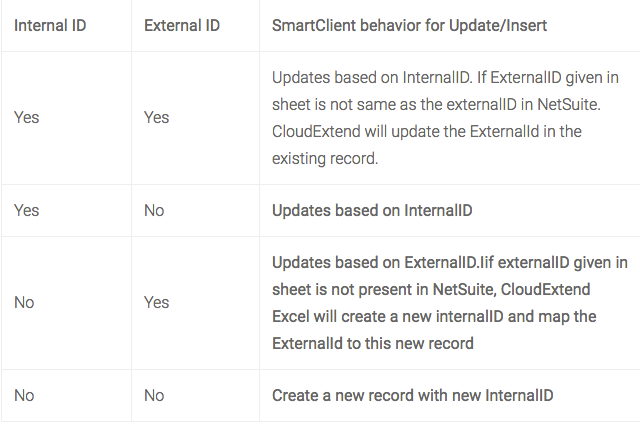 Can I create and update records using External ID in CloudExtend Excel for NetSuite? CloudExtend now supports Creation/Updating of records using External Id. Simply add the field 'External ID' to your CloudExtend template. In a template when both Internal Id and External Id are present, InternalId always gets the preference. Following is the Update/Insert behavior based on the availability of Internal Id/External Id in the template. Add the field 'External ID' to your CloudExtend temaplte.